In the imagery of land developers, the inhabitant is often reduced to a silhouette which is wiped out by the scale of the project. Blown-up on a billboard, it shows the skeleton of the image : seen from up close, the silhouettes are reduced to a cluster of pixels. I submitted my portraits of the inhabitants of the Prairies to the same treatment. The work is designed to be displayed in the street or on information boards. The portrait can be seen from afar but it becomes an abstract shape as the viewer gets close to it. 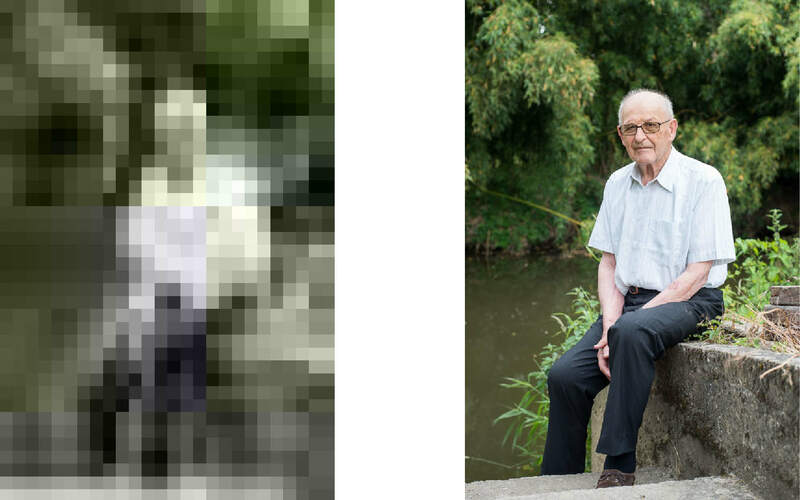 In the publication, only the pixelated portraits are visible at first sight. The original portraits only uncover with the help of a paper cutter, by cutting the corners of each block of pages.